City Book Reads are happening all over the United States. A town picks one book, and then everyone in town is encouraged to read that book, participate in activities related to that book, and discuss that book. Normally, the local library is the group that organizes the events and gets the entire community involved. This is a web site maintained by the Library of Congress. It is a great way to find links to libraries that sponsor City Book Reads. In addition, it gives you lists of which books each library chooses year-by-year. If you scan the list, you will notice that a good number of cities choose Rocket Boys/October Sky! 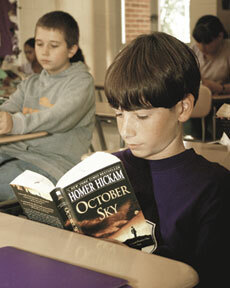 Above two photos: A class at Portland Middle School reads October Sky. Photos by Brian Ruckle, The Portland Progressive [newspaper], Portland, Tennessee, 2005.
for a City Book Read? Linda Hickam sends us this list which pretty much sums up what a powerful book and movie Rocket Boys/October Sky are. Saved their marriage - a couple was separated and he started reading the book on a business trip, and he emailed her and asked that she read it too. Then they started emailing back and forth about the book and its themes, especially about "passion" and eventually decided to give their marriage another chance. Led to a marriage (actually 2 now!) - A man wrote he met his bride because he read the book and went to a map store where she worked looking for a map of Coalwood. They were married August 9, 2001. Youngest letter - from the teacher of a class of 3 year olds ("I love you" letter in Teachers batch)! Oldest fan letter: 92, with photo enclosed no less! Many many sermons preached from Rocket Boys and The Coalwood Way have been reported. Required reading in many private religious schools and hundreds of schools across the WORLD in several languages. 6th year a 9th grade English teacher has used the book at Columbine High School to help them discuss and diffuse some obvious problem areas there. I have nice mail from the male teacher there, who also is a late bloomer in his dream to become a teacher too, nice story. He is identified and quoted on the front of the Teacher's guide to October Sky, website Teacher¹s button. That a father and son who had not spoken in 20 years went to the movie together and then stay up all night talking. Many reports from people who have rededicated themselves to family after seeing the movie or reading the books. The story led to many career changes in adults, many to teachers. People write that the story reminded them of their dreams, and that they could and should still work to make them come true. Many people write they decided to go back to college to complete degrees or fulfill other dreams. Teachers report is has been their best book to study ever, and it is not only taught in English classes, but Math, Science, Physics and Social Studies. They use the book to study a full rage of things from fitting in and family problems, to career choices! Oddly enough, there have been several "flood" stories where the books were the only thing left unharmed and unwet...including one incident in our own home! An ADD boy got interested in the movie, read the book and started applying himself, now no longer needs meds! A diabetic bright 7 year old boy saw the movie and decided to be scientific about helping his diabetes and has come up with a Flintstone Vitamin and chromium picolinate program that has lowed his need for insulin that his doctors are interested in and documenting! A therapist assigns the movie to her juvenile delinquents clients with wonderful results - the HH Therapy letter in the Teacher's section. This woman has become my volunteer therapist to assist me when a particularly worrisome letter comes in to Homer from a badly troubled youth. They write him when they should have professional help, but they identify with Homer because he wasn't the best looking or smartest, and had family and school trouble but still succeeded. We don't even have children, and yet we give kids and parents advice all the time! Another lock-up Juvenile Detention facility has the movie available to rent for inmates...one of only a few films allowed in their movie library. Homer had a last couple in a signing line in Houston say that they had waited to be last because they wanted to tell him that the man was in his first week of astronaut training and it was because the movie and book made him decide pursue an old dream and to reapply - and he was accepted! Emergency rooms report they show the movie to scared young people, either sick or there with loved ones hurt or sick. Children write they want to be astronauts of course, but many have decided to study harder after knowing the Rocket Boys story and they write when they have succeeded in their goal. Book is a best-seller in Japan, where the movie is very popular too. They are having a lot of trouble with their youth now too, so I have heard that is the draw. Schools in Korea, Brazil, Japan and Australia and Canada have written they are studying the book as a class. Many letters from kids and adults all over the world say they loved the book or movie. The themes seem to be universally understood and for all ages! Cancer treatment clinics have told us they have the book available to read there during treatment or for people waiting for people being treated. A women wrote her car was stolen and the one thing she was most worried about was her signed Rocket Boys in it. She got the car and book back unharmed! Many people reported at movie showings, that the audience stood up and clapped or one said an older man who stood up and said loudly "Every kid in America should see this movie." Plane showings had people clapping wildly, including one time Homer was on the flight and had not told anyone the movie they were seeing was about him! The movie was featured to be shown second (an honor) at the Venice Film Festival in Fall of 1999. It was shown immediately after "Eyes Wide Shut" which received only mild acclaim. After the showing of October Sky, which ended at 2am, the crowd cheered and bravoed - everyone at Universal was astonished at the enthusiasm and were crying. It was a great moment and we were there!" There are lots of ideas on that page about activities you can have during the book read. In Portland, Tennessee, in our 2005 City Book Read, among other things, we held a 50s style sock hop. 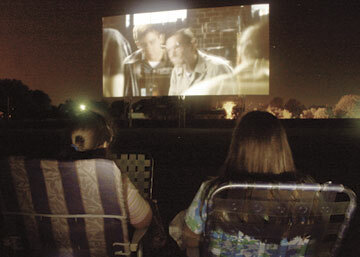 Probably our "most visible" event was when the library rented the local drive-in theater just across the border in Kentucky, and had a special showing of October Sky on the big screen. For many of us who never saw the movie in a movie theater, this was quite a thrill! Above two photos. 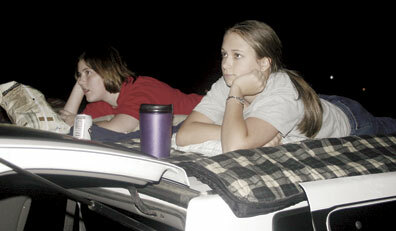 Viewers enjoy a special showing of October Sky from lawn chairs and roofs of cars. Franklin Drive-In Theater, Franklin, Kentucky. Photos by Brian Ruckle, The Portland Progressive [newspaper], Portland, Tennessee, 2005.